Secure the transport of your products in buckets, jugs and Jerrycans. Stabilize your products packaged in plastic buckets, cans or jerrycans Secure your transports. The packaging of products in plastic buckets, cans or jerrycans is efficient for liquid, pasty or powdery products. They provide a high level of safety in storage or transport operations, particularly with regard to regulated or dangerous products such as chemical product. 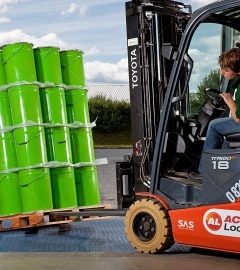 A simple and economical solution for transporting intermediate products. However, these containers have a weak point. Their geometry renders them unstable and their constituent materials (plastic or metal) make them slippery. CGP COATING INNOVATION, specialist in anti-slip coatings, proposes innovative solutions designed to address the instability of all types of packaging such as plastic buckets, plastic or metal cans, and plastic jerrycans. Don't wait any longer, stabilize your products with our anti-slip slip sheets from the Logistics range ...Our products are specially designed to address problems associated with your rigid containers. Our anti-slip slip sheets provide a solution to these unstable types of packaging and guarantee that plastic buckets, cans and jerrycans are properly secured on a pallet through to their final destination. Our corrugated cardboard anti-slip slip sheets of the Logistics range are inserted at the base of the pallet and between layers of products packaged in plastic buckets, cans and jerrycans on the pallet. Your rigid containers anchor themselves into the mass of the anti-slip cardboard and remain stable. For your products stored outdoors for extended periods, STABUFILM® provides an appropriate response. The very high coefficient of friction of our products prevents your products from slipping and ensures a high degree of cohesion for the entire pallet. 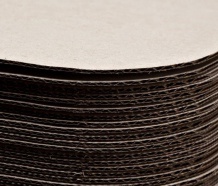 Our range of STABUSTOP® Corrugated Cardboard anti-slip sheets and STABUFILM® Plastic film. Secure your national and international shipments of regulated products and dangerous materials (infectious, polluting, and explosive materials, etc...). Stabilize your pallets after they've been opened. Protect your personnel from the risk of accidents. Participate in preventing professional hazards. Reduce your space dedicated to storage.